I'd like to say it's going to be the first of the goblins, since Minion's KS got cancelled and is being rejigged as large monsters with actual goblins to happen as a metal KS sometime in 2015. And if it's not the goblins, it should be - now that the competition issue is resolved and before it comes up again! - Get those models to market, mate! Of course, it could also be Pillars of Destiny, but I guess I shouldn't guess about those. Goblins and Elves are indeed being very much worked on, but we do not want to exit with just a couple of models, we want to provide a variety when we release a new race. We've already commited that mistake in the past with our Undead and Daemon factions, with people continuously emailing us asking for more (and thus also -very logically- saving on P&P). P.S. The competition issue has no reason to come up again, we respected it and as far as we are concerned it's over. Wait. Minion wants to do goblins in metal? In 2015? I declare Shieldwolf the winner and champion. You may not have felt there was a competition, but Minion clearly did--a competition they had to lose at all costs. 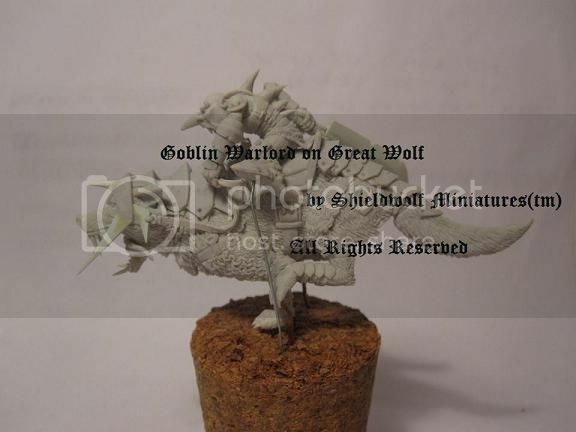 Have we seen any clue as to what a finished Shieldwolf goblin will look like? I know we saw body sketches a while back, but that's all I remember seeing. If there's been more, please enlighten me. I still want that Barbarian Warlord- he reminds me of my Diablo 3 character! @highlord tamburlaine We have not revealed any models, but here's an official "leak" we'll also be posting soon enough in our Facebook page. Angelos has worked a lot on their history (which I believe you will find rather interesting and different from what we usually see with dumb and silly goblins), but he's currently stopped and is working on the Elves. 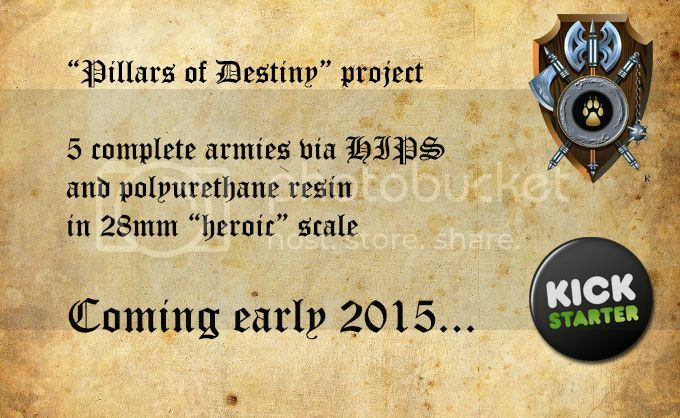 The Pillars of Destiny project sounds like a Kickstarter for a game starter. That is correct. 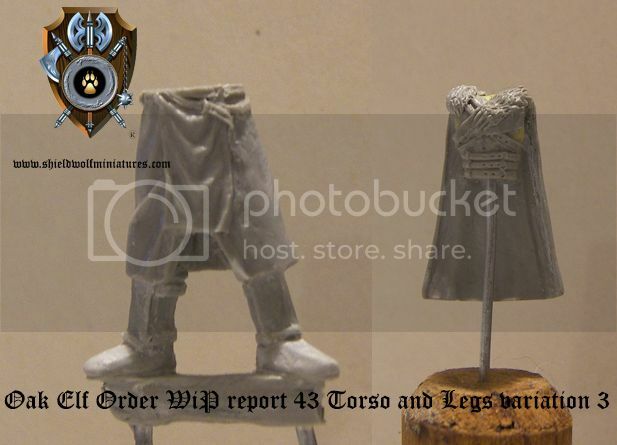 Despite the fact current revenue from sales of our range is steady and reassuring, the financial capabilities a crowdfunding project offers would allow Shieldwolf to speed up the production of other HIPS for 28mm heroic fantasy kits, something only one other company worldwide is currently manufacturing (everyone else has dropped out, names are irrelevant and unnecessary). "Shieldwolf:War is coming"(TM) is an army game, not skirmish. This takes requirements at an entirely different level. Also, for some of our armies, there are no "proxies", so we must make them available. We have resisted the cheaper PVC option and frozen all our ready-to-mould resin kits, taking thus a further financial blow. But the Community in our opinion is clear on what it wants, we have received pm's,emails etc and they are all asking us for more "real plastic" kits reasonably priced, thus we are trying our best to sevice it. This alone should speak for itself. 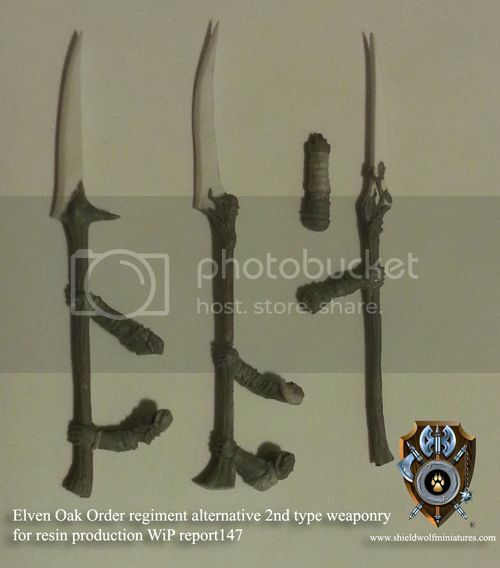 This is the Oak Elf kit, like others we have shown, this also ready to cast in resin and can be available in less than a month, with 2 weapon options and -as always- in regiments of 20s. It was planned to be based on 20mm bases. We are currently sculpting some Elf characters and experimenting 3D sculpts, but the final decisions of what will be included or not will be made one day before the official announcement. Otherwise, we will maybe looking at some of these later in 2015. But this is a company that is taking carefull steps, learning and evolving with specific plans. Quality has not been compromised, neither has our customer service. So, these too (i.e. 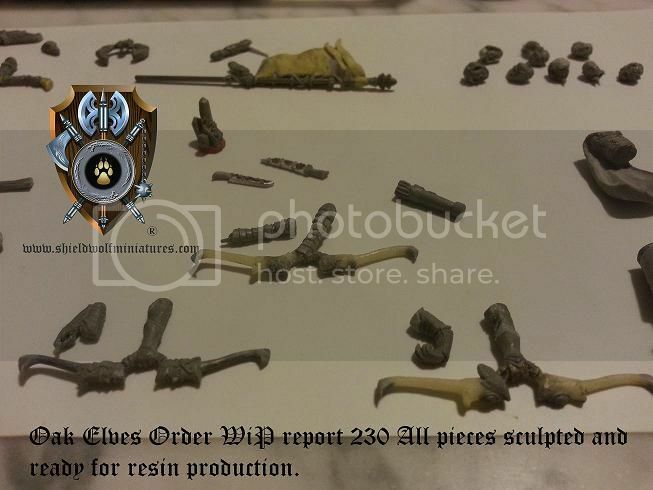 the Elven Oak Order), along with other projects are all put aside in favor of going full plastic for the troops in our game. And this was a decision not easily taken, I can assure you of that! One may say that all previous Kickstarters who launched in order to finance HIPS have miserably failed, and those who have made it were to finance non-"heroic" scale in the cheaper restic option and not HIPS. The difference with this KS is that it is run from an established manufacturer who also has an additional ace up his sleeve; Shieldwolf will be heavily co-funding it. Fantastic! I love the Goblin sculpt, and the news is very exciting! So, I guessed correctly? Does that mean I won something? I'm a winner, guys. I totally won something. Guys, guys, I won. My luck has changed now; it's all finally starting to pay off. Uhhh....I hate to break it to you Bob, but I think the contest was just for the November release. Maybe you will still win that one? No no no, man, it's cool. I totally won this. Like a boss! It's a good thing, too, 'cause I really need this win. Bob, you're always a winner in my book! It's a book of Lottery tickets, right? Hey guys, I won the Lotto! No need for Shieldwolf's free prize now, 'cause I just won the Lotto. 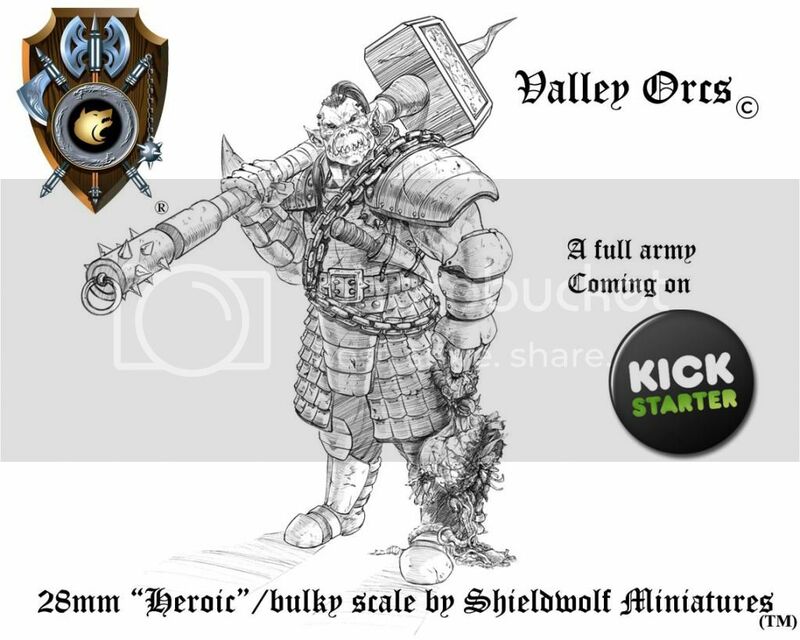 Shieldwolf Miniatures enters a new category, that of the busts. 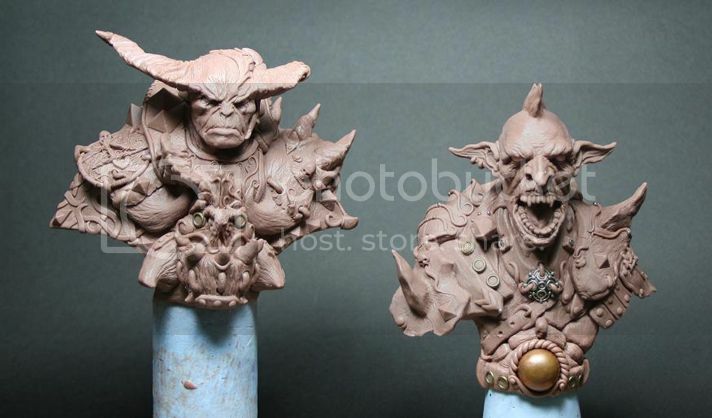 First 4 are sculpted by the extremely talented Giorgos Tsougkouzidis. In the meanwhile, our largest project of all, that of "Pillars of Destiny" which has taken trully a lot of work, time and funds is ahead of schedule! A huge innovative project co-funded by this Company, with exclusive top-quality European manufacturing and a precise list of stretch goals. Meaning if all are reached, there will be no more. 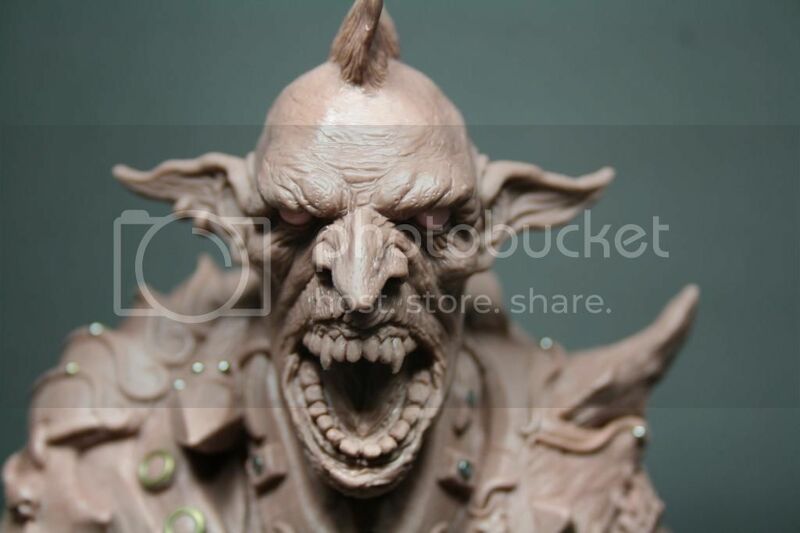 The goblin bust, in particular, looks awesome, and I don't usually like busts. So great job. Wow! And well.. I was not expecting that to happen. Those busts are fantastically detailed. I even like the goblin and I almost never like goblin miniatures. a precise list of stretch goals. Meaning if all are reached, there will be no more. Very smart move. More people should work that way to ensure they don't overextend themselves. Don't know carlos13th if it's a smart move or not but we think it's an honest approach we are no KS company. Everything we have produced has been from Angelo's pockets, we have never asked others for backing before nor are we willing to make this a trend. The crowdfunding route was almost dictated to us from the huge crowd it attracts away from bussiness practices like ours. In 2 years we have poured a larger capital than most of any other colleagues we know of and are pouring tenths of thousands of pounds in this one as well. We have no experience in this but consider ourselves accountable to our backers and will try our best to prove them right, we currenltly have a 100% perfect customer track record and we are not willing to compromise that. Are the 5 armies you plan on funding ones we've already seen, or 5 totally new and different than what you've teased so far? 20mm, 25mm, 40mm, 50mm and 100mm. Troops in HIPS and everything else in our polyurethane resin. To our knowledge some of these armies do not currently exist by any other manufacturer in this scale, others however do in different esthetics/vision. You don't see too many wargame companies coming out of Greece, do ya? 5 armies... 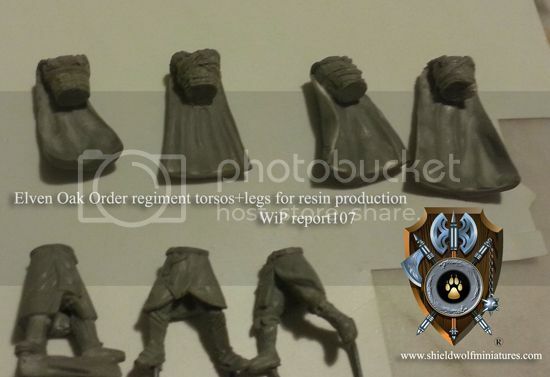 In HIPS... 28mm.. By a company that had already proven it can make GW-quality HIPS sprues. My god. I have to start saving. Right now. I'm interested! I hope that you are just 'revealing' to project in December and not launching it. Basically everybody stateside will need some time for our wallets to recover from Christmas/Thanksgiving. I also hope that you have an initial funding goal that is "low" with appropriate stretchgoals, meaning you aren't asking for the funds to tool five armies from the get go, rather the funds to tool half a sprue or something. Did SW mention if they'd be coming out with their own rules too? Doing so in December is suicidal. Official date will be announced some time before and we are currently looking at mid/late-January but may just as well be begining of February. It's much lower than you'd expect. A lot of discussion was put into this and we tested a range of options. We believe to have come up with the best -and most reasonable- solution. The entire structure of the campaign will offer a wide variety of minis from each race/faction, with HIPS as choke-point stretch goals. In theory, we can still deliver a beta-version of our game just in time for the campaign even if we prefer to have them tested as much as possible first. We have playtested till nausea, but we want other people -and minds- to see for themselves. We are currently talking to people -and gaming clubs- worldwide to see if they can help us out after Easter 2015. Anyway, this has not been decided yet. The campaign -for now at least, although most probable to remain as such-, stands as "miniatures only" campaign. In the following 2 months we will be releasing more information and reviewing sculpts and artwork. Hope you will enjoy the ride as much as we! "...At times the King himself would take a handfull of faithful warriors and head over to the Kingdom of Talliareum to pilage the villages. But what made this Orc different, was that instead of killing everyone in his path, he kidnapped Humans of certain crafts, like blacksmiths and architects. He enslaved them and had them work for him. This was very strange behaviour for the Orcs and they initially thought the King was going mad. Aburgoth wasn't called The Terrible for no reason however and obviously no-one dared challenge him. Orcs deserve big hammers once in a while. They also deserve to get to wear real armor. Hate the ramshackle nonsense you usually see orcs wearing. Dude looks ready (or at least was in the process of already) to get his fight on. The fact that he is able to stand upright compared to his hunched over and half naked mountain relatives is a plus. Looking great. Did I miss or has it not been stated what the first few hard plastic kits would be? Well, I just read this thread from top to bottom and went to check out Shieldwolf's site. I must say I'm cautiously excited. I haven't held any of the minis in person, but from the photos of what seem to be actual minis, they look to be of very nice quality and for a good price. I really hope - and it sounds like they've put a lot into this - that SW takes the opportunity with hard plastic minis to make them as modular as possible - weapon options and the like to maximise the use we all get out of each sprue. Things like the head/neck and arm/shoulder joints being compatible amongst species and so on. Regardless, an ordered progression of stretch goals that actually correspond to appropriate costs, and no overextending with hamfisted ideas and no planning? That sounds like the sort of campaign I could really get behind. And I LIKE the occasional kickstarter that goes off the wall, but almost none of the ones I've backed that have done that have delivered on time. So, anyone want to hazard a guess what the other four armies will be? I'm quite excited to see any of the ones SW has suggested, but offhand I'd prefer Elves, Dracantropii, Araves and Goblins, and probably in that order - I just hope their Araves don't become cheap historical stereotypes though in the background, but it sounds like SW has put a lot of thought in, so I'm optimistic on that part. In terms of what's perhaps more likely than just fulfilling my person demands - goblins would be a shoe-in though, since in a lot of fantasy worlds they join up alongside orcs. Undead as well probably, because everyone and their uncle seems to find them fascinating, which I've never understood - but hey, it takes all kinds. I feel like European-medieval style humans would be kind of a waste at this point, since there's so much historical stuff out in plastic now, unless SW has a REALLY cool concept to change them up dramatically. Infernals and Barbarians could be a possibility too since they're already in resin, but that might be a reason not to get into them at this moment. Regardless, I'm quite excited for it - and as much as I'd like to see the KS up so I can have minis sooner, delaying till after the Christmas craziness is probably a great idea.